I tend to prefer vegetarian cooking and eating, but I am no vegetarian. Growing up, we were not big meat eaters anyway, so I can go days on end without having any. When we do eat meat, the quantity is pretty small in comparison to what a lot of people are used to. In general, I feel better after a fresh meal like this one, so I tend to cook this way most of the time. Tabouleh is a pretty common dish where I come from (I'm half Middle Eastern), so it's something I've made pretty much since I can remember. For several years now I have been opting for quinoa instead of bulgur because I think it tastes even fresher. 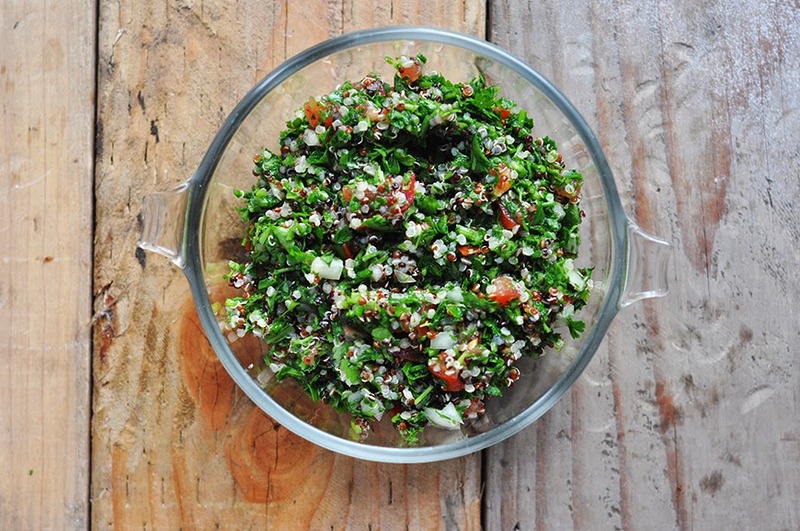 Nowadays a quinoa tabouleh is pretty common place. The same goes for yogurt cucumber salads. 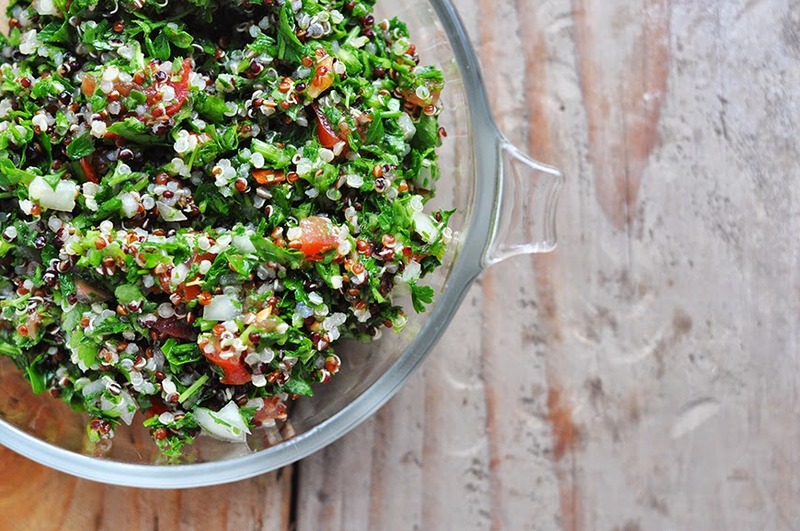 They are a very common dish in Middle Eastern food, and like tabouleh, super easy to make (actually, easier). 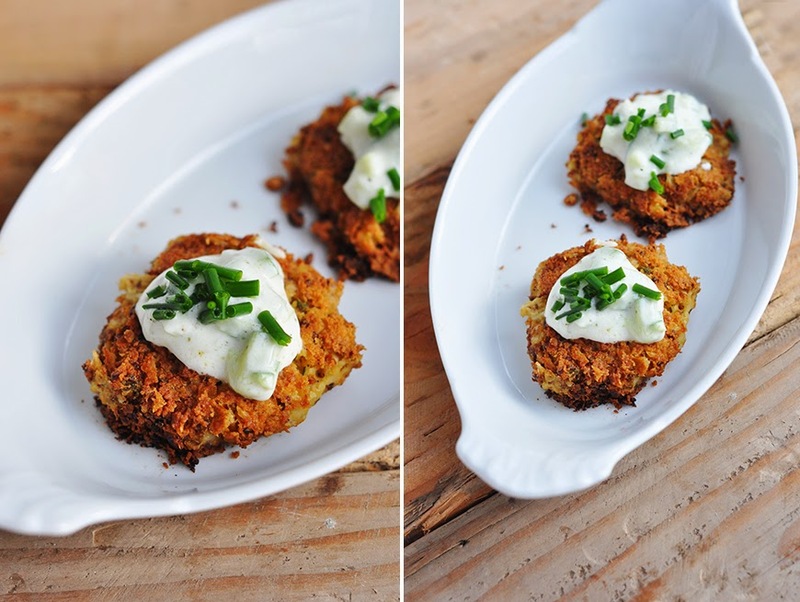 Lastly, falafel. I tread lightly when calling these "falafel" because they are made with chickpeas rather than fava beans, which is traditionally what a falafel consists of. 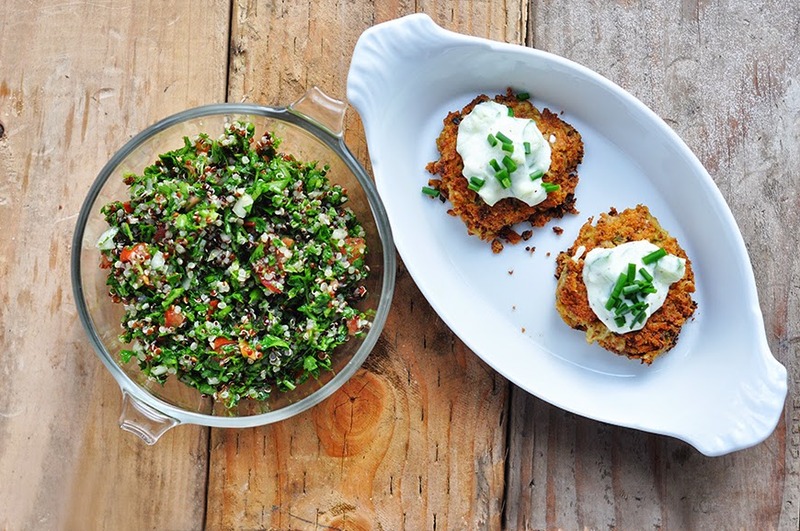 Nevertheless they are made in a similar manner and therefore, conceptually, are falafel. 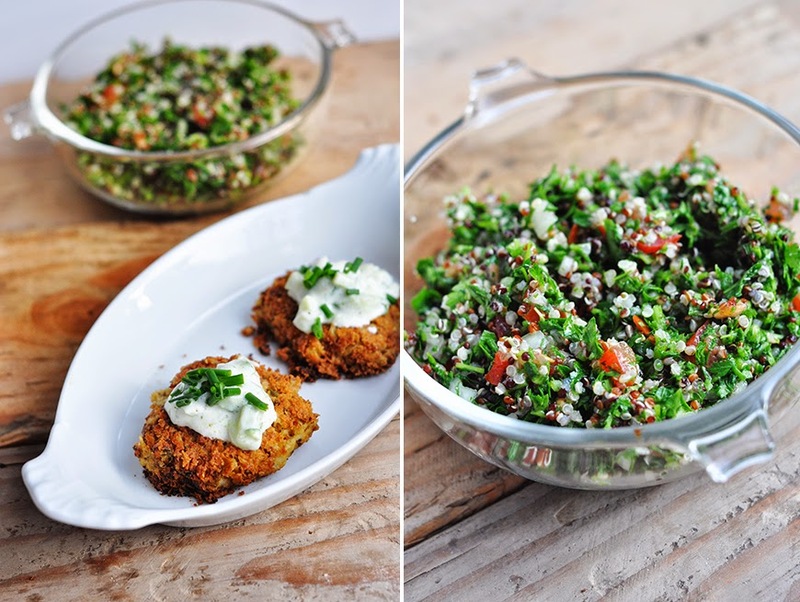 A lot of times I see this dish prepared where the more obvious ingredient is the quinoa (or bulgur) versus the parsley. I say, to each their own, but the way it's generally made is with a majority ruling of parsley and the other ingredients scattered about. • 1/4 cup chilled quinoa (boil in 1/2 cup water for about 15 minutes, be sure to not let this overcook, place in freezer if cooking it around the time you are making the salad, so it can chill as you chop the rest of your ingredients). • Cook your quinoa and let chill. Finely chop all the ingredients listed above (parsley, tomato and onion). • Place all the ingredients in a large bowl, drizzle a generous amount of olive oil over, squeeze both lemons and season with salt and pepper. Toss all the ingredients together and you're done. These can be difficult to keep together while cooking, depending on how their consistency turns out. So handle with care, even if they seem to be getting mangled they will still taste delicious. Also, there are quite a number of recipes out there, this one is my own adapted from a mishmash of browsing recipes and common sense. • In a blender, blend all the ingredients listed above (beans, onions, galic, parsley, a dash of olive oil, and spices, salt and pepper). You'll notice that they will not blend easily without a little water, if you need the water (the olive oil was enough for me) be sure not to add too much, just enough to get the ingredients moving. • Remove your blended ingredients and place in a bowl. At this point I felt the consistency needed thickening so I added a few tablespoons of flour and mixed well with a spoon. 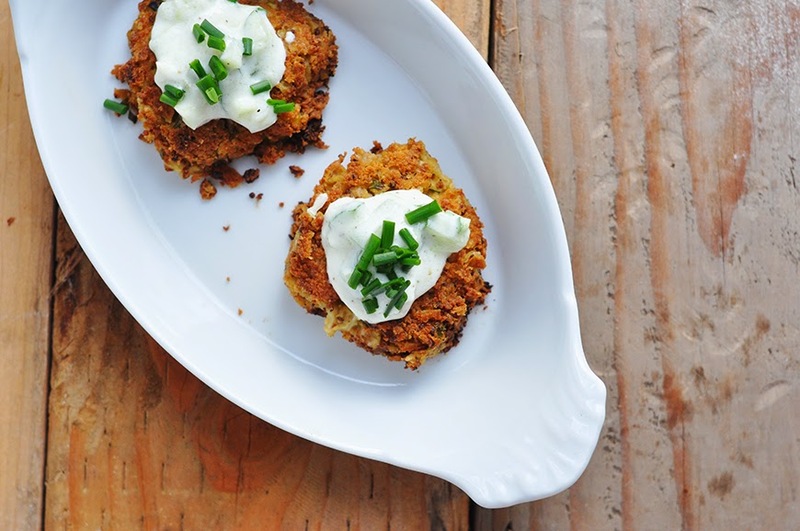 • Heat some olive oil in a frying pan, and form small rounded patties by hand, carefully placing them into your frying pan. • Let them cook on each side until well browned. I would say about 2-3 minutes per side. This is a variation of this recipe I posted last summer. The only differences is I omitted the dried mint and chopped the cucumbers much smaller so they would work as a dip for the falafel. • Finely chop your cucumbers and mince your garlic. • Place the yogurt in a bowl, toss in your cucumbers and garlic, drizzle with a generous amount of olive oil and season with salt and pepper. • Mix all ingredients very well. I garnished my falafel with some chopped chives.